Back in 2015 Steinberg tagged Groove Agent 4 as the 'ultimate drum studio'. GA4 was certainly a very significant change from previous GA-badged virtual instruments. With a very deep feature set, and multiple 'Agents' covering electronic drums, percussion and acoustic drums available within a single instance, it certainly staked a pretty good claim for the 'best all-round drum tool', combining elements found in the likes of virtual drummer products such as Superior Drummer/EZ Drummer and virtual MPC-style drum machines. So, if GA4 was the 'ultimate drum studio', where do you go from there? With Groove Agent 5 now with us, what have Steinberg done to take their flagship drum tool to an 'even more ultimate' status? With software as deep as Groove Agent, any review is only likely to scratch the surface of what's possible. The focus here will obviously fall on the new and improved features in the v5 release. However, the core functionality found in v4 — and summarised in the June 2015 SOS review — remains intact. In brief, that means you get three different drum Agents — Acoustic, Beat and Percussion — any combination of which can be loaded into the four Agent slots in a single instance of Groove Agent. As well as a substantial collection of sounds, there is an excellent set of 'styles' (collections of preset MIDI patterns) in various musical genres, and these can also be assigned to a pad system for triggering. There is also a very neat Style Player system for easy triggering and performance creation as well as a comprehensive MIDI pattern editing environment. 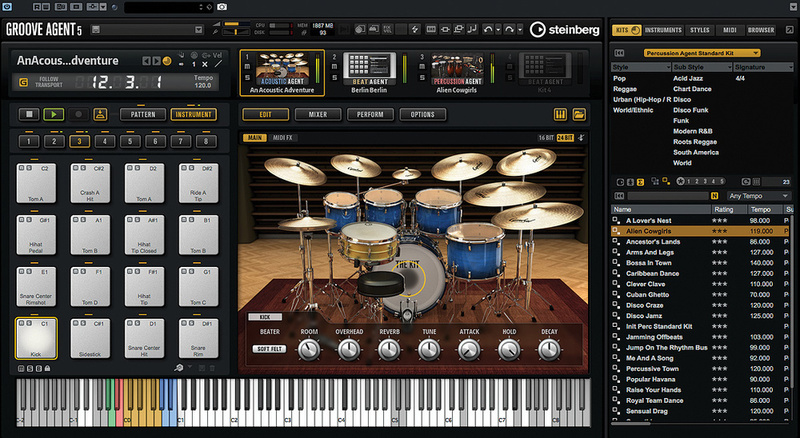 If you want additional content, Steinberg have a series of genre-based expansion packs for sounds, patterns and styles. Groove Agent 5 £153; upgrades from £85. Prices include VAT. Groove Agent 5 $179.99; upgrades from $99.99.